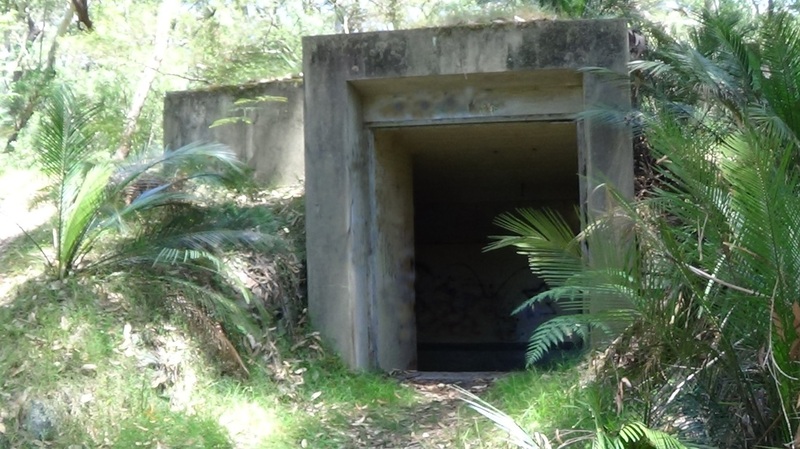 During World War 2 a semi-underground radio bunker was constructed as a part of the Moruya Aerodrome complex, hidden among the nearby abundant forest. About as big as a house, it's located well away from the runways, to enable it to keep in operation if the aerodrome was being bombed, bombarded by shellfire from the sea, or overrun. Two rooms, one for the radio equipment, one housed the generators and the engines that powered them. At each end a pill-box allowed sentry duty and, if the worst came to the worst, a position for machine gunners. Construction was unusual, it took advantage of the ground being sand, as much of Broulee is built on today. A large hole was dug, the building was constructed in the hole. The concrete for the structure was made using the sand from the hole. Lastly, when the building was complete, the remaining sand was mounded over it, to help camouflage it and to soften the impact of shellfire or bomb blasts. Being South of The Island, it's not on Broulee Bay. But you can find it today by driving along George Bass Drive towards the Airport, and noting the lagoon on the inland side of the road between the Canoe Tree and the road to the racecourse. On the southern (Moruya) edge of the lagoon, a dirt road/track heads into the bush, keep right and the bunker is not far up that track. World War 2 Semi-Underground Radio Post Bunker Near Moruya Airport. RF.